An environmental-impact statement for Millennium Bulk Terminals was released to the public April 28. 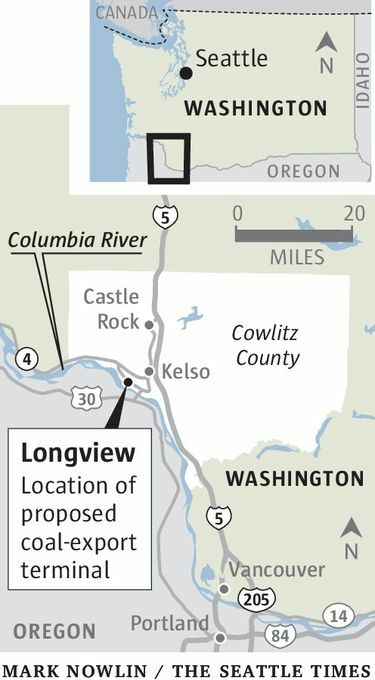 A proposed coal-export terminal in Longview would significantly increase Columbia River vessel traffic, bump up cancer risks for a local neighborhood and result in a net addition of some two million metric tons annually of greenhouse gas emissions, according to one of the most ambitious environmental reviews in state history. Released to the public Friday, the final Environmental Impact Statement for the Millennium Bulk Terminals project is a multivolume document developed by the state Ecology Department and Cowlitz County in a study that got underway in 2013. It received an unprecedented 267,000 public comments, which reflect, in part, the controversy of turning Washington into an export hub for a fossil fuel that helps to drive climate change. The report will be a key source of information for 10 agencies that will be involved in considering more than 20 permits that will be needed for the project to move ahead. “We may get some criticism for time that we took, but we are talking about a major project that is not just a new dock or a couple of new buildings,” said Maia Bellon, director of the state Department of Ecology. The terminal would be the largest coal-export facility in North America, handling 44 million tons of coal annually that would be stored in an area the size of 50 football fields, according to Bellon. It is proposed to be built on the site of a former aluminum smelter, and developers say it would generate $43.1 million in state and local taxes and 2,650 jobs, if jobs indirectly generated by the project are counted. The coal would arrive by rail from western coal mines, adding some 16 trains a day along state tracks. To carry the coal to Asia, ships would transit the Columbia River 1,680 times a year, which would represent about a 33 percent boost in seagoing traffic on the waterway. The state environmental review does not try to assess the economic viability of the terminal. Instead, it takes a deep dive into a wide range of effects from the proposed development. All together, the report identities 23 different areas of impact, including nine that could not be mitigated. One involves a 10 percent increase in the risk of cancer in a Longview neighborhood that would be subject to more diesel pollution due to the rise in rail traffic, according to Bellon. Other consequences cited by Bellon involve damage to 24 acres of wetlands and dredging some 48 acres of the Columbia River. The coal dust deposited along train tracks or by the facility would not exceed air-quality standards for human health, according to environmental modeling in the study. One of the most complex pieces of the study involved an investigation of the greenhouse gas emissions resulting from the project. That included an analysis of the emissions resulting from the train transport of the coal to Longview, overseas shipment and how the coal would be expected to be used in Asia. The study concluded that the project would result in a net global increase of some two million metric tons of carbon emissions annually, compared to a business-as-usual-model where the export facility is never built. That net increase equals about 2 percent of Washington state’s total greenhouse gas emissions in 2012. Bellon said that one option would be for the company to make investments in projects that reduce carbon emissions to offset the added greenhouse gases. But the study does not make permitting recommendations. One sublease required for the project from the Department of Natural Resources already has been denied, and is now the subject of litigation. Jan Hasselman, an attorney with Earthjustice, said that the report’s findings should prompt the denial of state and county permit applications for Millennium. “Any other outcome would be scientifically and legally unsupported,” Hasselman said.